I could not afford the Death Star. Because it cost four hundred dollars. “But we need it!” my 9-year-old cousin Adam said, speaking not only for himself, but for his entire family, the whole Hagen clan. We were in his bedroom in Indianapolis, which was a vacuum cleaner’s worst nightmare. Lego pieces were everywhere. There was a crash-landed A-wing and Han Solo’s Lego head was rolling through the wreckage of red and gray bricks. 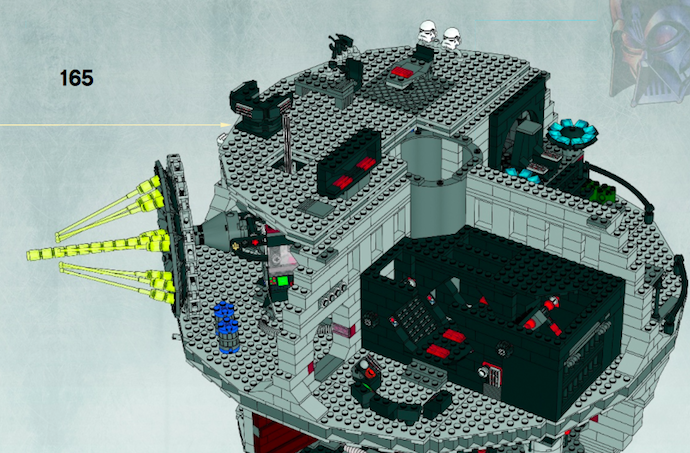 Seeing this space-opera carnage, immediately you’d know it: Star Wars Legos are Adam’s favorite. “We really need the Death Star,” he said, like this was a team effort or something. 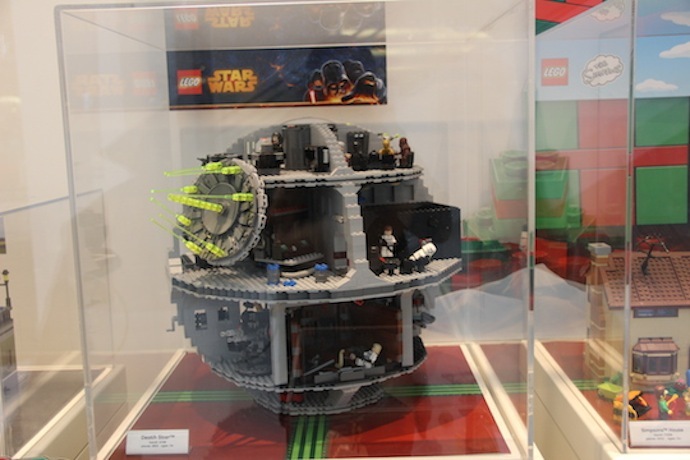 Later on, in Minneapolis, I stopped by the Lego Store in the Mall of America to scope out the Death Star. I had high hopes for the Mall of America. I thought maybe this convoluted temple of pure consumerism would convey something spiritual to me, like I would finally find cultural salvation between an Auntie Anne’s Pretzels and Aeropastle. No dice, though. The Mall of America is just four regular malls stacked atop each other with a couple of roller coasters spiraling through the center. A morose teenager dressed as Spongebob Squarepants posed for pics with kids. The Lego Store was sheer bedlam. A girl with an excessive number of barrettes in her hair gleefully led her parents to the Death Star. She wanted them to be as amazed by it as she was. And I could see why. The Lego Death, while not worth four hundred bucks, is impressive. The girl tapped the cubic plastic case that contained the Death Star, hoping Han and Luke and Leia and Darth would spring to life. They’d duke it out while we mourned the destruction of Alderaan in a galaxy not quite as far away as we once imagined it was. Except the Death Star, seen here fully assembled and operational, wasn’t really a Lego. Not to me. 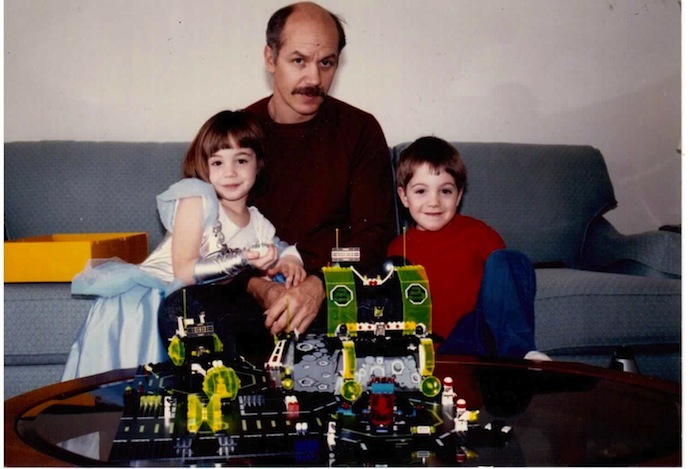 When I was Adam’s age, Legos were my everything. And I was their god. Tactile memories: fingertips, carpet, and great piles of Lego bricks, with their sharp edges that always produced a yelp of pain when stepped on in the wrong way. On my hands and knees, adventuring. My twin sister and I, we were the architects, the world-builders. We faced every artist’s chief dilemma: how to realize the wild aspirations of our imaginations, how to turn this rubble of bricks into castles and space stations and underwater-space station-castles. And when I stared upon the Death Star in the Mall of America, I understood it for what it was: the nadir of imagination. Sure, we always built what was on the box cover first. That was what drew us in. Katharine or I would be enticed by the Saucer Centurion or Explorien, and so we’d cajole our grandma or mom into buying it for us. Sometimes, if we’d done a good enough job of holding onto our allowances for the month, we’d even buy it ourselves. And then we’d follow the numbered guide and render the Lego in its prescribed box-cover design. Then we’d get bored and bash it right to hell. Boredom was the foundation for our greatest creations. We’d be bored some weekend afternoon or during the summer—for the summer was, in my ebbing memory, both a glorious time of epic adventure and an endless epoch of brain-melting boredom—and we’d look at our armada of Star Hawks and Aquanaut Octopods and think, Let’s create something new. We were fearless, you had to give us that. To create something new meant that first we had to obliterate what we’d already built. Legos were a finite resource. And we couldn’t let our imaginations be tainted by the limitations of the present. Like revolutionaries, we needed to destroy in order to realize our dreams for the future. Hours upon hours went into the worlds we built brick by tiny brick. Sometimes we’d fixate on the same project. Other times, my sister, a much wiser delegator than me, would assign my dad or me some lesser task while she worried about the primary objective. Our blueprints were shape-shifters, forever changing based on our whims and predilections and based on the fact that we never had enough of those one-dot-by-two-dot flat connector pieces. In this vein of creativity, nothing was ever finished, no project ever complete. Every citadel or starship was really just a first draft. We kept dreaming bigger, grander, thinking of how we could tack on one more jet engine or crenellated spire. Our Lego inventions were always almost done. So when I saw the Death Star there, safe in its cubic plastic case, I wasn’t particularly excited. It would be more compelling, I thought, as a ruin, with all the promise a ruin can inspire in the minds of the young. The wreckage of Legos in Adam’s bedroom is his inheritance, passed down from Katharine and me to his old brothers and then on to him. They’ve been used to build the most wondrous of cities and most destructive of machines. They’re the ruins of our unruly imaginations and have been stepped on countless times. What better heirloom could there be? When I told Katharine about Adam’s wish to own the Death Star, she said she’d chip in fifty bucks, except there was a caveat. Katharine said she’d only contribute if she could play a major role in building it. I shared her stance. I mean, doesn’t that sound like Christmas fun? It’d be a hell of a family project: to assemble the Death Star while my mom watched that one Bing Crosby movie she always watches and my dad fiddled with the logs in the fireplace. We’d take hourly breaks to benchmark our progress and drink marshmallow hot cocoa. Of course, under Katharine’s rigid supervision, I’m sure we’d annihilate Alderaan before dinnertime. It would be a holiday for the ages, a day the Lego citizens of Alderaan would rue from beyond their intergalactic graves. But this story doesn’t have a happy ending–at least not for Adam who didn’t end up finding the Death Star under his Christmas tree. He’ll have to keep praying to Santa Claus or saving up his allowance, neither of which seems like too practical of a solution. Still, I can’t imagine how excited he would have been to unwrap the monolithic toy. The only thing more amazing would be when, a couple weeks later, Adam finally got sick of the thing, which too perfectly resembled the picture on the box, and smashed it to smithereens and was left only with 3,802 Lego pieces in cataclysmic disarray. Out of that mess, Adam could build something new, something never quite finished, his own space station to inhabit the galaxy of his wily imagination where the future is only a ruin away.